Are you comfortable enough with yourself to simply be yourself regardless of what others might think of you? I’ve done some pretty silly things in my life, yet the funny thing is that they have created lasting memories for me. The things I’m talking about probably fall a little outside of “social norms” and maybe even in the vein of “ok to think it, are you really sure you want to do it”. But I come back to the memories that they have created for me, and I’m sure glad I was comfortable enough in my own skin to “let my freak flag fly”. Here are a few events that I hope bring you a few chuckles, and I hope you’ll try to picture yourself as the person letting your freak flag fly. Would you have done this? Would you have the memories to laugh about later? I helped organize an event where Great Big Sea (my favorite band, by far) was the featured performance. With the committee knowing how much I liked the band, I was appointed to lead the band from their dressing room to the area where pictures were being taken with guests, and then back to their room to prepare for their performance. After the pictures were taken, and on our way up the back stairs, I had this “crazy thought” to start singing one of their songs. I’m sure my Inner Critic was screaming at me that I was crazy, this wasn’t social norm, they might judge me, etc, but I started singing the last song on their current album. I wasn’t really surprised, but I couldn’t help but smile when the band joined in and started singing with me. If you haven’t heard of Natalie, she’s an amazing fiddle player from Cape Breton. She and her band were doing a performance on a tour called “Christmas in Cape Breton”, and the stage was set up to look like a Cape Breton living room, complete with a rocking chair in the middle of the stage. At one point during the performance, she pointed out the rocking chair and offered anyone in the audience an opportunity to “come on down” and sit in the chair. I instantly thought “hey, I’m crazy enough to do that”, but then common sense and social norm got the better of me so I reluctantly sat on my hands and sat back to enjoy the show. But then, and I swear to this day, she provoked me. She went on to say that they had being doing the concert all over the place, and that they always made the offer for someone to come and join them in the rocking chair, but – and here it comes, here’s where she provoked me – “no one had ever taken them up on their offer”. I hollered out loud “I’m coming”, and the lights in the house came up so that I could see my way, and I ran down and took my place in the rocking chair. I was there for about 4 or 5 songs, and at one point she came over and sat on my knee and fiddled. What a memory, I’m grinning again as I write. I’m sure glad I let my freak flag fly in this case. I think this one needs a bit of background as I may be dating myself a bit, so here goes. One of our “big box” stores in Canada is called Canadian Tire. In the early to mid-80’s they had a commercial featuring this young buy (named Albert) being suited up with hockey equipment at one of the stores. As the boy was trying on the equipment, the commercial switched to him dreaming of playing hockey in the NHL, and the entire crowd stood and cheered his name in a resounding chorus of “Albert, Albert, Albert”. Now for those of you who have ever been to a game in Toronto to watch our beloved Maple Leafs play, our crowds are not known to be the loudest or the most engaging. But there I was sitting in the stands and I decided “why not?” and so I started hollering at the top of my voice “Albert, Albert, …” and to my honest and overwhelming surprise, the crowd of about 15,000 people joined in. There was virtually the entire arena doing the Albert cheer, and for a moment I found myself wishing my name was Albert. Another case where I’m glad I decided not to be afraid to be different, and not afraid to try something a little outside the box of social norms. I have no idea if this ever happened at another game before or after this, but I’m smiling again at the memory. Were any of you at that game in the 1984/85 season, I’d love to hear from you. I have a few other moments like this that have left me with lasting memories. In each case, there are probably people that think I’m crazy, or that they could never do that. I’m sure glad I didn’t allow myself to hide from letting my freak flag fly. So what about you? Have you ever had any moments like these where you did let your freak flag fly and now you have lasting memories? Or do you have cases where you wish you had done something like this, but you succumbed to the perceived judgment of others and didn’t? Next time a “crazy thought or idea” crosses your mind, will you have the courage to say “why not?” Will you let your freak flag fly? I love your stories of living outside the box. I’ve done many things outside the box. Some positive and some negative. But you are right, they do leave great memories. There are times where I wish I wouldn’t have sat on sidelines as you like to call it, but I’m definitely not afraid to fly my freak flag. Loved this blog. Thanks Keith, let that freak flag fly brother!!!! Howdee Ken! Figured I better respond since I spoke out about missing your blogs lol. I have also created my own share of silly moments and my darling son is the first one to call me crazy or weird, while the rest of the family simply furrow their eyebrows with a query in their eyes about my sanity. Even my own Mother could only acknowledge that “I was different”. Yet you are so correct, because it is those Freaky Flag moments that still bring a wide smile of joy to my face and a fulfilling sense of accomplishment. Thank you for waking up my inner child on this rainy day Ken! Keep Flying High, and congratulations on scoring Great Big Sea! back in 1966 my family went to Glasgow Scotland. Maureen and I attended a performance. I cannot remember his name. On the stage with him were 3 wooden horses and he invited anyone to come up and ride any one of those horses and race accross the stage. I was challenged to go up. I could not resist a challenge so up I went. I was trailing the leader by quite a bit until I finally realized how to operate the stupid horse and then it was look out here I come. I thought it was a dead heat but the entertainer thought that the other guy won and was awarded the prize. I havent spoken to him since. Hey Pops, I can picture you doing that even today. As they say, the apple doesn’t fall far from the tree. Thanks for sharing. Do you want to know what I’ve noticed over the years? I am concerned less and less with what others think of me. In fact, I’m grown up enough now to admit that what I do and who I am is based on what I think of me, my beliefs, my intentions, my kindness, my humour, my work, my play, my love, my life, and life just keeps getting happier and happier, for me and everyone around me. I wonder sometimes why our society expects us to do and be what they want us to be, when it works out better for everyone to just be ourselves. So strange, we humans can be. I think, though, that we’re beginning to figure out how it’s meant to be, how we’re, each of us, meant to live. So true, my friend. Thanks for sharing. And keep on being your authentic YOU!!! 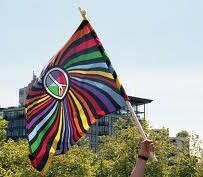 Well…I think my freak flag is pretty much flappin’ in the breeze these days! Got a good LOL from your Great Big Sea story Ken, and all I can say there is, ‘Me, too!’. I think a personal favorite was dressing up as Prince for a costume party (or ‘Fancy Dress’, as we say in the UK). I changed skin color, had a mustache, everything and practiced the voice. Although the splits has always been beyond me. It was very freeing and I’d do it again! I loved smiling right along with you, Ken, as you told your stories. I love everything about this post, letting my flag fly!